It's taken many attempts to actually leave the house wearing socks with open-toed shoes. 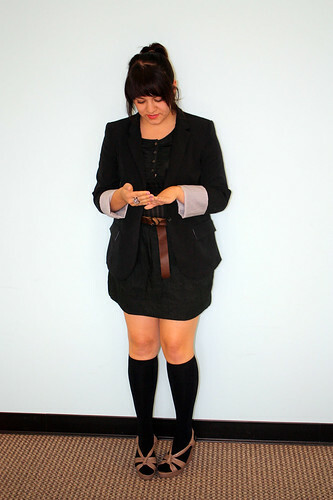 My brain has been trained that this is wrong, but I must say, I think I'm a fan of the knee socks + wedge shoes combo. 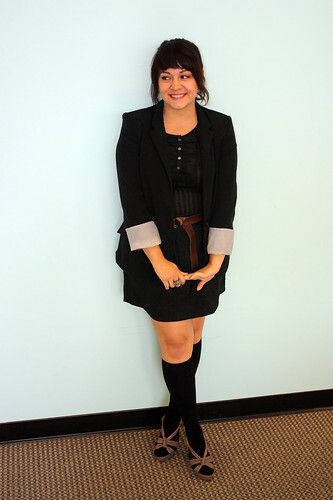 A couple of coworkers dubbed this look "School Girl Meets Harajuku Chic." What do you call it? Black knee socks, possibly from Target? Love how you work the all-black! The brown belt definitely makes it pop. I love this outfit! You've successfully made knee-high socks look chic!